Each element of this trip contributes to being a truly immersive experience in to the natural wildlife and flora of Botswana. The accommodation is varied and is specifically chosen to blend with surroundings and leave minimal traces behind. The camping in particular allows uninterrupted access to the natural behaviours and sounds of the parks, without human interference and boundaries. Each site is respected, cleaned and rotated to ensure the future sustainability of these wonderful areas. There is very minimal waste, water is conserved and the camping is primarily off grid. It is a genuinely authentic insight in to the wilderness of Botswana. The houseboat glides through the delta accompanied by smaller boats to nip in and out of the narrow channels. The use of smaller boats is less intrusive, less intimidating and allows for greater access to the lives of the hippos, crocodiles and abundant bird life that surround the delta and it's edges. We have a maximum group size on this trip of 12, particularly small, which helps ensure our impact on the environment in minimal. All of the included camping meals will be prepped and cooked by the guide team prior to being enjoyed around the campfire under the stars. 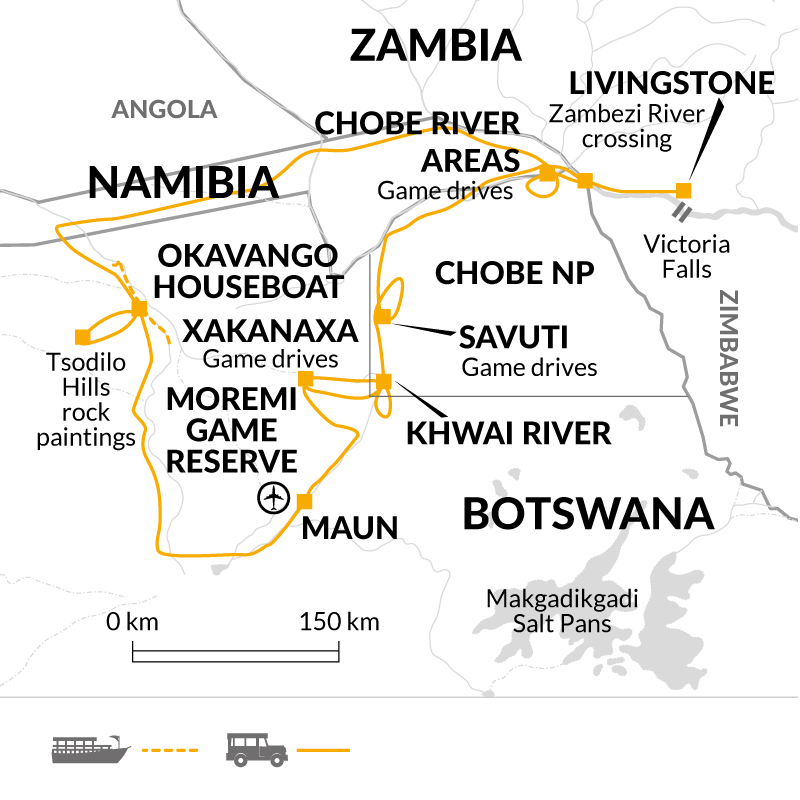 We use a purpose built four-wheel drive vehicle with 12 seats and excellent wildlife watching opportunity. As a travel company we are continually looking for ways to improve and are proud to be ‘Responsible in everything we do’. Education is key, and so all staff, Tour Leaders and partnering suppliers are trained in responsible and sustainable tourism. At our Head Office, we continually strive towards a sustainable and planet-friendly working environment, including having solar panels installed and a company commitment to reducing our plastic usage. We work with inspiring, knowledgeable local leaders who bring the vacation to life with their own experiences and insights in to living in Botswana. Whilst camping and on the boat we also have a local team who help with preparing and cooking delicious meals as well as setting up the camps and dissembling them after our stay. We are guided by their safety expertise with the wildlife and their passion for the natural environment and keeping the bush as pristine as it was found. There are cultural elements to the trip, including the ancient rock paintings in the Tsilodo hills, the villages that we pass through and opportunities to purchase local wares. It is our priority to always to be welcomed back wherever we visit, interact positively with the local community and provide a fair deal for all those included. As a company we have valuable and longstanding partnerships with UK charities Toilet Twinning and Send a Cow, plus many smaller initiatives and projects around the world. We’re members of the UK travel industry body AITO because we believe it’s important to share our knowledge and experience, as well as learn from other operators.